Overview: This is Manager-HR Priyanka Jain, associated with AirAvaitor, having past experience more than 3 years in IT Industry. Our Co-founder Capt Shekhar Gupta is in Aviation & Travel Domain for almost 8 Years now. They have been to 500+ cities across 50 odd countries. We are a group of Pilots and IIM guys currently lead expansion for few Aviation & Travel Start-ups called www.AirAviator.com , www.Flying-Crews.com and www.AlfaTravelBlog.com He also has association with many successful Missions like Mission to Canada, Philippines, AsiaticAir, Ola, Oyo & so many Start-ups before this. 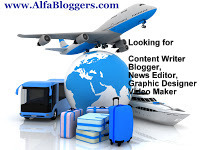 We are building a Digital Agency to Empower Independent Aviation, IT & Travel Bloggers. Duties & Responsibilities: Responsibilities will be assigned as per the Trainee’s Profile. We a group of Pilots and IIM guys currently lead expansion for few Aviation and Travel Startups called AirAviator and Alfa Travel Blog. I have also been associated with Nission To Canada, AsiaticAir, Ola, Oyo & so many Startups before this. Me and a few enthusiasts are building a Digital Agency to Empower Independent Aviation, IT and Travel Bloggers. We are just starting out and would love to feature All of You. That would mean we would love to do a Guest Feature on you on the Blogs and across our Social Media handles. Which means it gives you a lot of backlinks to create SEO.